Every 4th of July, the city of Ralston and it’s Chamber of Commerce host the premiere, must-see, Independence Day Parade in Nebraska. The event starts near 84th and Q Streets in Ralston at 1:00 p.m. and winds through the lovely tree-lined streets of old Ralston, ending at 72nd and Main Street nearly 3 hours later. Our family tradition is to pack a cooler with lunch and refreshments and to drive/walk to Independence Avenue in old Ralston. We take our own lawn chairs and blankets and arrive a half hour before the parade starts. The parade is a blast. In addition to bands, clowns, and fire trucks, every prominent politician in the state attends and walks the parade route. Typical attenders include the Nebraska Governor, Nebraska’s U.S. Senate and House members, as well as the Omaha and Ralston mayors. The 2010 event has over 106 parade entries. The city of Ralston has dubbed itself “Independence City”, and for good reason. In addition to the annual parade, Ralston hosts a quilting and art show, a teen dance, a picnic in the park, a fun run-walk, fire department water fights and a fireworks display. Entertainment for the entire family. Check out the entertainment schedule, then drive to Ralston this year. Join in the celebration! Happy Motoring! 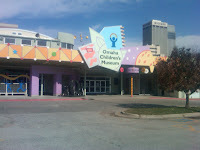 Located at 500 S. 20th Street, the Omaha Children’s Museum is a great place to take young children up to the age of 10. The museum is designed to permit small children to exercise their imagination and to become excited about learning. Permanent exhibits include a creative arts center, an imagination playground, and a science and technology center/lab. The ball factory, the dance room, grocery store and traveling exhibits are our family’s favorites. The museum’s winter hours are: Tuesday through Friday from 10:00 a.m. to 4:00 p.m.; Saturday from 10:00 a.m. to 5:00 p.m.; and Sunday from 1:00 p.m. t0 5:00 p.m. Check out the museum’s calendar, and Happy Motoring! Located at 3616 S. 132nd Street, between Center and L Streets, Skate Daze, is a good place to hold family or group outings, including birthday parties. Skate Daze fun activities include: roller skating, lazer tag, rock climbing, bumper cars, a roller coaster, and over 75 arcade games. Skate Daze has a snack bar that serves pizza, snacks and beverages. It is a great place for a high school “lock in”, with plenty of things to keep students entertained. Hours vary, but adult skating for the “retro” crowd is held Tuesday nights from 8:00 p.m. to 10:30 p.m. Happy Motoring!